More Americans are being killed in smartphone-related traffic crashes than official numbers can tally, according to a thorough and eye-opening new report from Bloomberg. Reporters Kyle Stock, Lance Lambert and David Ingold write that official records show that U.S. traffic fatalities have increased by 14.4 percent over the past two years. “In 2016 alone, more than 100 people died every day in or near vehicles in America, the first time the country has passed that grim toll in a decade,” they write. None of the usual suspects, like increased time on the road or drinking and driving, fully account for that spike. But the surge in fatalities parallels increases in smartphone ownership: the number of Americans who own a smartphone rose from 75 percent to 81 percent from 2014 to 2016, they write. And we’re using our phones a lot differently today than we did just three years ago, spending less time speaking and more time scrolling, swiping or sharing—activities that are distracting even if you’re not driving a car. That specific type of distraction could help explain why the “increase in fatalities has been largely among bicyclists, motorcyclists, and pedestrians,” the reporters write, people who are easy to miss if you’re looking down at your phone behind the wheel. Part of this discrepancy comes from how difficult it is to gather data on cell phone use and driving, which is getting harder as people turn to texting services—many of which are encrypted—rather than calling people. While it’s already illegal for drivers “to use a handheld phone at all in 15 states, and texting while driving is specifically barred in 47 states,” the Bloomberg team writes, each state reports accidents differently, making the National Highway Transportation Safety Administration’s job that much harder. Right now, only 11 states have accident reporting forms with a field for mobile-phone distraction, the reporters write. 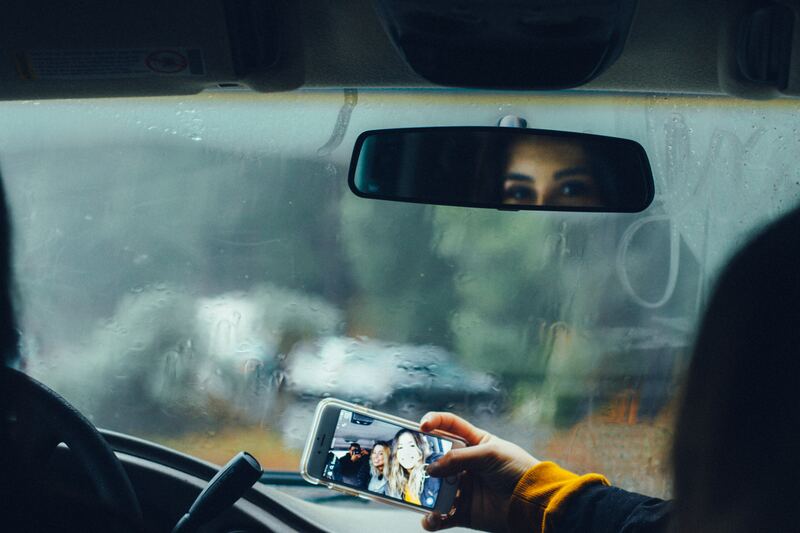 Part of the issue with passing legislation to make the roads safer and making smartphone distracting driving more socially unacceptable is the ubiquity of mobile phones. You probably don’t always stop your friends from reaching for their phone while driving, even if you know it’s unsafe, but you’ve probably been taught not to get into a car with someone who’s been drinking.